Another season of summer travel is upon us and, although the world is full of remarkable places to visit, there is nothing quite like spending the warm months in Europe! From the lush, rolling plains of Ireland to the cobblestone streets of Italy, we have the inside tips to make your journey across the Atlantic one to remember. Read more for a Hawkins International approved itinerary! Carton House, a luxury 1,100-acre resort located 25-minutes from Dublin in the countryside of Kildare, Ireland, will debut the first phase of a property-wide-renovation starting in May. The resort is a historic estate and great house that was the ancestral seat of the Earls of Kildare and Dukes of Leinster. Reminiscent of Carton House’s past, the refresh includes updated bedrooms located in the new wing of the historic hotel, the property’s banquet suites, Carton House Spa and new and updated dining options. The Stables, a gastropub located in The Clubhouse on the property for golfers, is a new dining outlet set to open in June. Here, golfers can relax and unwind after a round of golf on one of the resort’s two courses. The traditional Irish pub is housed in the home’s original horse stables and the new restaurant will serve Irish classics. On weekends, guests will be entertained with classic Irish music as they dine. 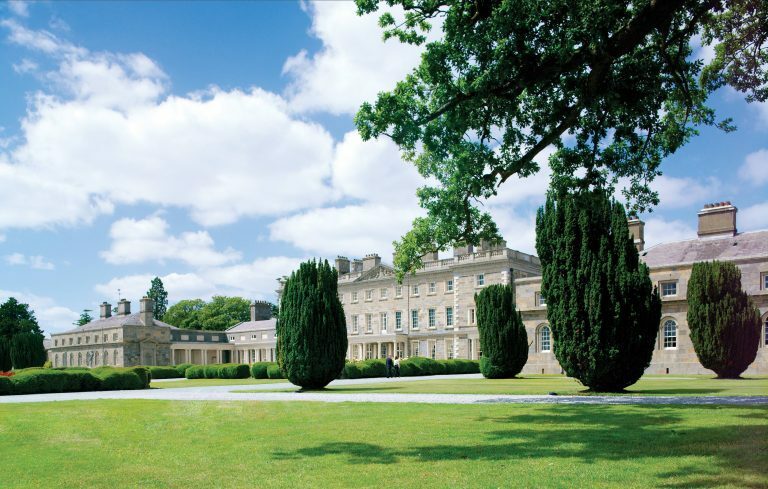 On the spa front, Carton House Spa will complete a full refurbishment in August. This includes a refresh to the treatment rooms which will be outfitted with a bright color palette that reflects the natural, earthy colors found throughout the property. Celebrating its 195th birthday this year, The Shelbourne in Dublin is the city’s most distinguished address, often times referred to as “the living room of Dublin.” Following the second phase of a multi-million euro refurbishment project, The Shelbourne is putting the final touches on the hotel’s public spaces including the entrance, lobby, and No. 27 Bar. The newly refreshed property is slated to unveil in April 2019, officially moving away from Renaissance Collection to Autograph Collection. The hotel will also debut the city’s first ever outdoor terrace, expected to be the place to see and be seen. 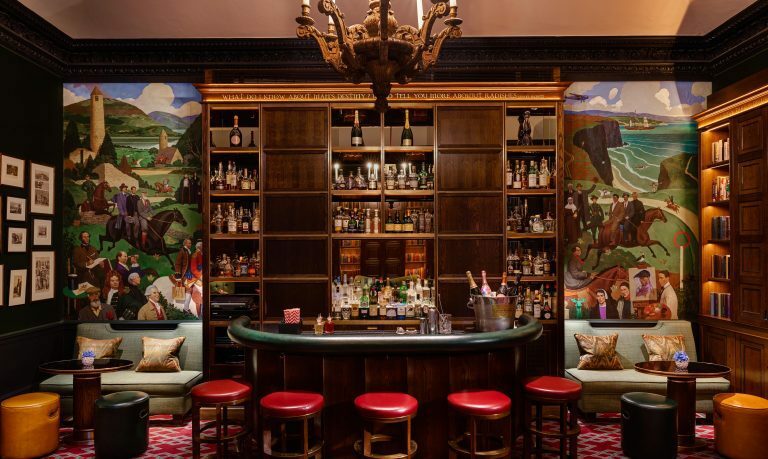 1824 Bar, The Shelbourne’s former resident’s only bar will officially open to the public and introduce the hotel’s very own Whiskey Connoisseur, for all whiskey-pairing needs. 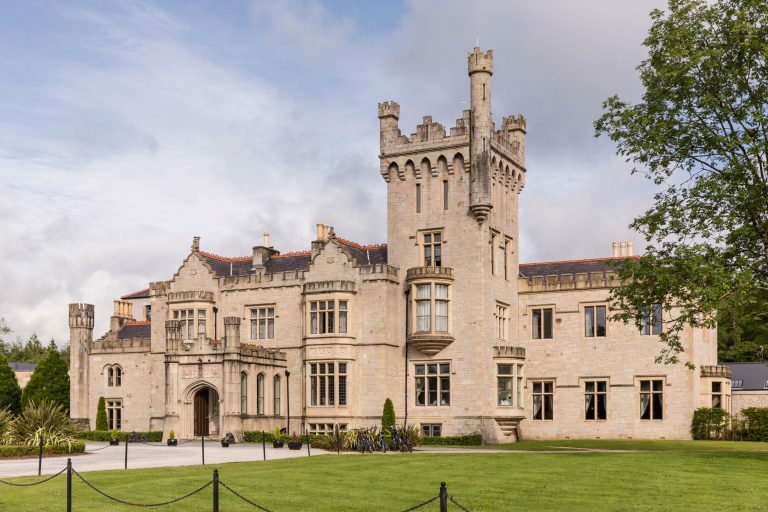 Nestled at the water’s edge of Lough Eske in Donegal, Ireland, Lough Eske Castle is the only five-star castle hotel in the county, offering travelers timeless allure and luxurious, contemporary accommodations. One of the most under-the-radar locations in Ireland, Donegal is the ultimate destination for adventure seekers. Whether it’s sea stack climbing or catching some of the best waves the country has to offer, Donegal does not disappoint the thrill-seekers. Donegal town is also great for live Irish music at pubs, restaurants and Magee Tweed Factory. On the flipside, Lough Eske Castle is a cozy and relaxing retreat complete with 96 guestrooms, seasonal culinary offerings and CARA Organic Beauty Spa at Lough Eske Castle Hotel with an ice fountain, sauna, steam room, and an infinity pool. Fresh, local Irish produce is served at in-house restaurant Cedars Grill, as well as a collection of more than 60 fine whiskeys in the Gallery Bar. Guests can also enjoy afternoon tea or a quiet read in the drawing rooms. A luxury alpine adventure awaits you in the Bernese Alps this summer at Gstaad Palace. The glamorous hotel, located in the heart of the lovely chalet village, is one of the last family-owned Palaces in the region. 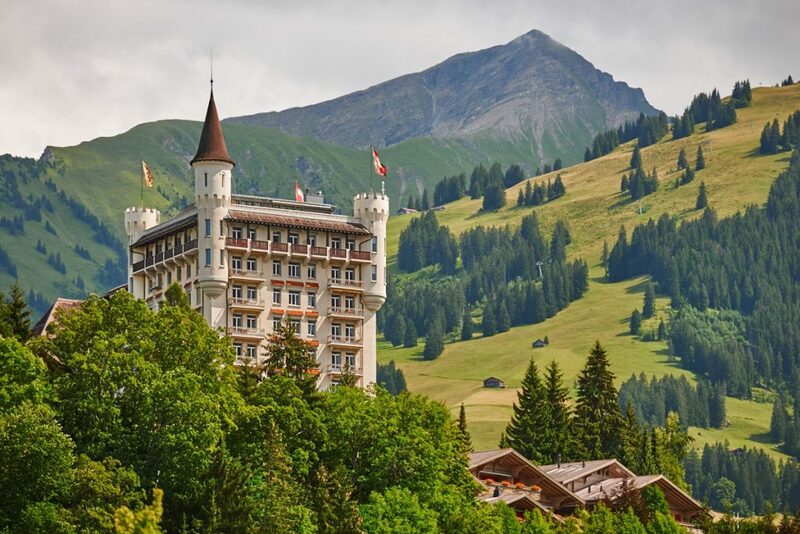 With soothing temperatures and limitless opportunities for sightseeing, culture, and adventure, Gstaad Palace is a dream destination. There are 104 guest rooms with 26 suites including two Tower Suites and a Penthouse Suite. There are five restaurants, one which is seasonal called La Fromagerie and serves a decadent Champagne and Truffle Fondue (prior to it becoming the restaurant, this space used to house Swiss gold during WWII)! Guests can stroll through the picturesque village of Gstaad with its excellent shopping or go on one of the many walking and hiking trails and discover the stunning panorama of the Alps. For the more adventurous mountain biking, rock climbing, horseback riding, canoeing, river rafting, paragliding, and off-road driving and Jeep safaris excursions are available. Travelers looking for a truly special experience can schedule a hot-air-balloon ride at dawn or a helicopter breakfast on the nearby glacier! The hotel has myriad possibilities to choose from as well, including an Olympic-sized outdoor pool, golf in the Bernese Oberland, squash and tennis courts, a full-service Spa and several dining and nightlife options. 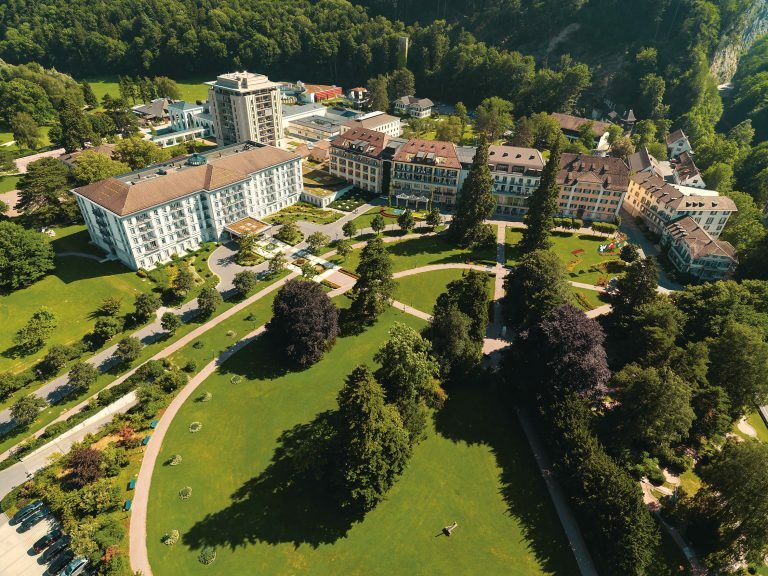 Settled in the picturesque town of Bad Ragaz, Switzerland, only an hour outside of Zurich, Grand Resort Bad Ragaz had long been hailed as the leading medical wellness resort in Europe. The resort is comprised of three luxury resorts, specialty spa suites and a Medical Health Center and Clinic, and is fueled by the natural thermal waters of Bad Ragaz. The waters, which have a variety of health benefits, are at the center of the resort’s exclusive Haki treatments, which offer an immersive experience to revitalize the mind, alleviate physical and emotional stress. The resort also delights guests with a slew of gastronomic experiences from Michelin-starred IGNIV to Mediterranean-inspired Olives D’Or, in addition to two brand new restaurants coming this summer in celebration of its 150th anniversary, alongside a multi-million dollar renovation of its flagship property, Grand Hotel Quellenhof. 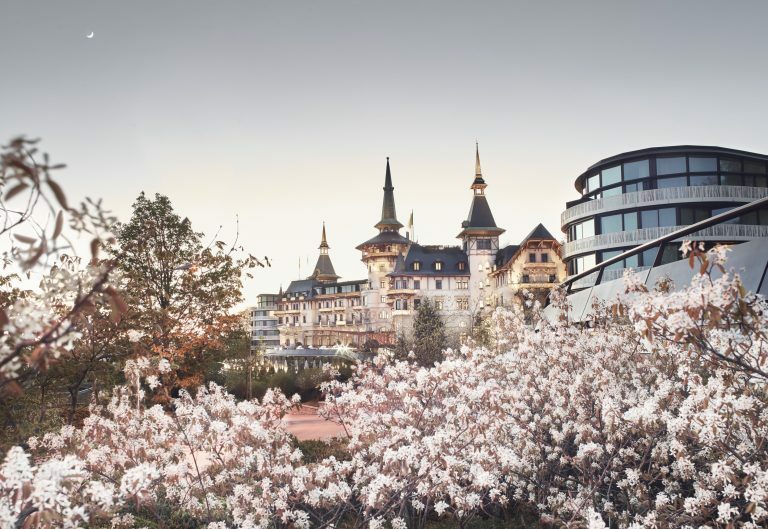 Perched above picturesque Zurich, well-established grand dame hotel, The Dolder Grand is at the forefront of cutting-edge luxury in hospitality. The hotel offers guests Michelin-starred fine dining at The Restaurant as well as relaxed favorites at Saltz as well as the opportunity to take in the property’s exquisite art collection including works by some the world’s best artists. The hotel is well known for its state of the art 4,000-square meter spa with a wide array of spa and fitness facilities, including pools, saunas, running tours and personalized luxury with the hotel’s Dr. Burgener Switzerland partnership. Located in Florence and Rome, Ferragamo-family owned Lungarno Collection makes for the ideal summer Italian getaway. 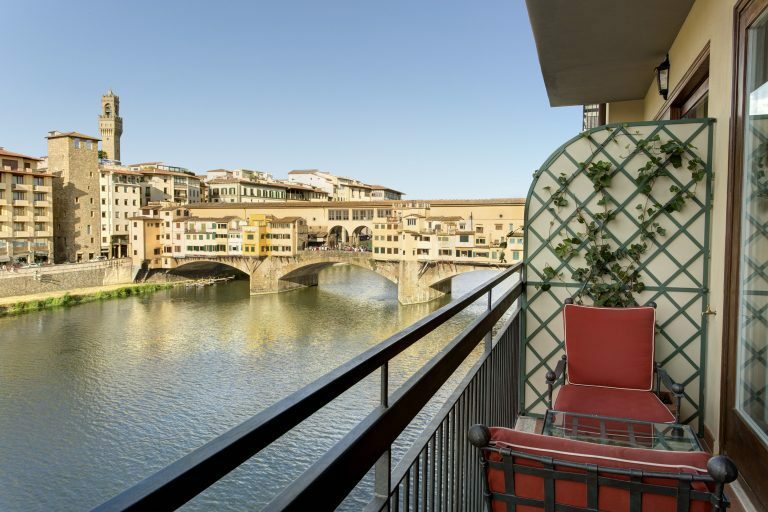 With boutique properties including Portrait Firenze, Portrait Roma, Gallery Hotel Art, Continentale and Hotel Lungarno, guests are able to embrace summer in Italy with an array of different experiences and activities. At the Florence properties, visitors can get out on the infamous Arno River and take their chances at fishing. With renowned fishing guide, Oliver, guests will have in-depth knowledge of the wildlife of Italy and the Arno River at their fingertips and be able to experience Florence from a whole new angle this summer. For those looking for more of a thrill in Rome, Portrait Roma offers guests a tour of the city in a Ferrari, testing the skills of drivers, and getting an unexpected experience in the bustling city. 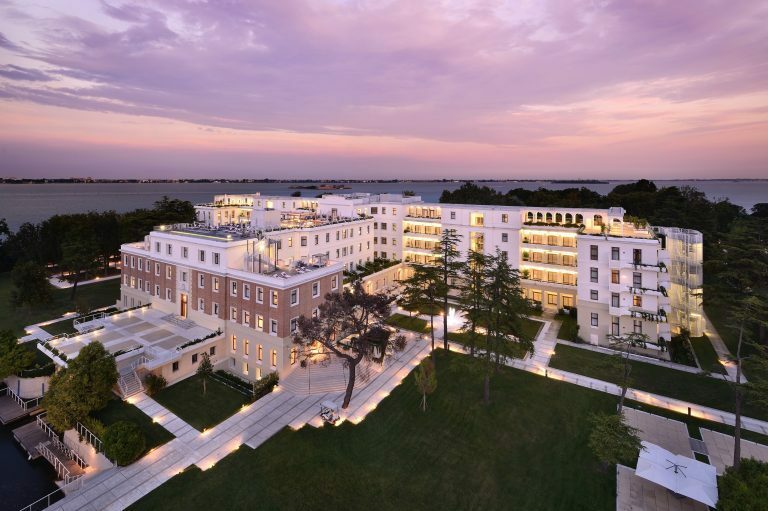 Located on its own private island, Isola delle Rose and just a 20-minute complimentary boat ride from Venice’s St. Mark’s Square, JW Marriott Venice Resort & Spa is the perfect summer getaway. The resort makes it easy to unwind from a busy life or after a day on the mainland as it offers sensational views of Venice, plenty of green space studded with native olive trees, harvested each fall for olive oil used on property, and multiple pools, including a family pool and adventure park. Guest accommodations range from Junior Suites to the Villa Rose, a private two-bedroom villa next to the lagoon. This April, the resort is welcoming a re-invigorated fine-dining restaurant Fiola at Dopolavoro Venezia spearheaded by well-renowned chef, Chef Fabio Trabocchi. Guests can anticipate dishes that combine seasonal ingredients locally sourced from Venice’s famous, centuries-old Rialto Market, and the Adriatic Sea. The resort is also launching its brand-wide family programming called, Family by JW where families will leave JW Marriott Venice feeling inspired, whether cooking together in The Sapori Cooking Academy or going out for a family bike ride through the private island. 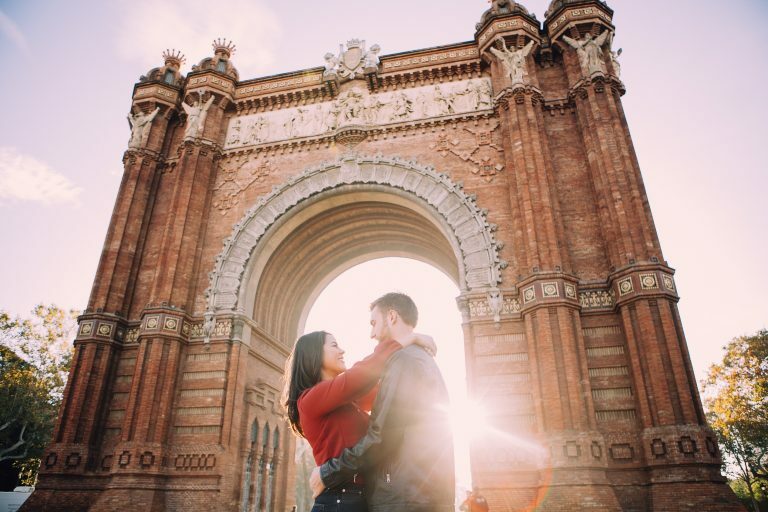 Launched in 2013 and inspired by the belief that memories are the best travel souvenir, Flytographer connects travelers with a community of hundreds of local photographers in 250 destinations around the world for fun, candid vacation photo shoots (about an hour) that capture the magic of travel. Flytographer is the first company to market global vacation photography services and is changing the way people remember their trips by providing one-of-a-kind local experiences and beautiful photographs that will be cherished for generations. Occasions captured include honeymoons, anniversaries, families on multi-generational trips, couples’ and friend getaways, solo adventures, and many surprise marriage proposals. The best part? Each Flytographer serves as an informal local tour guide, sharing insider tips on things to eat, see and do, including the most photographic spots around the city, plus hidden gems and the places to avoid! Flytographer is located all over Europe from the Amalfi Coast to Berlin to Dublin, Paris, Rome, Seville and more! Launched in July 2014, La Compagnie is an exclusively business-class airline operating regularly scheduled transatlantic flights between New York (Newark International Airport) and Paris (Paris Orly Airport). Celebrating its 5-year anniversary this July, the French airline will mark the exciting occasion with two major milestones. On May 5, the airline will launch a new seasonal route to Nice operating five times weekly between the months of May and October. This new route will offer travelers direct access to the South of France during prime season at an unbeatable fare; currently, the only other business-class option to the region is with Delta, starting at $5k+. 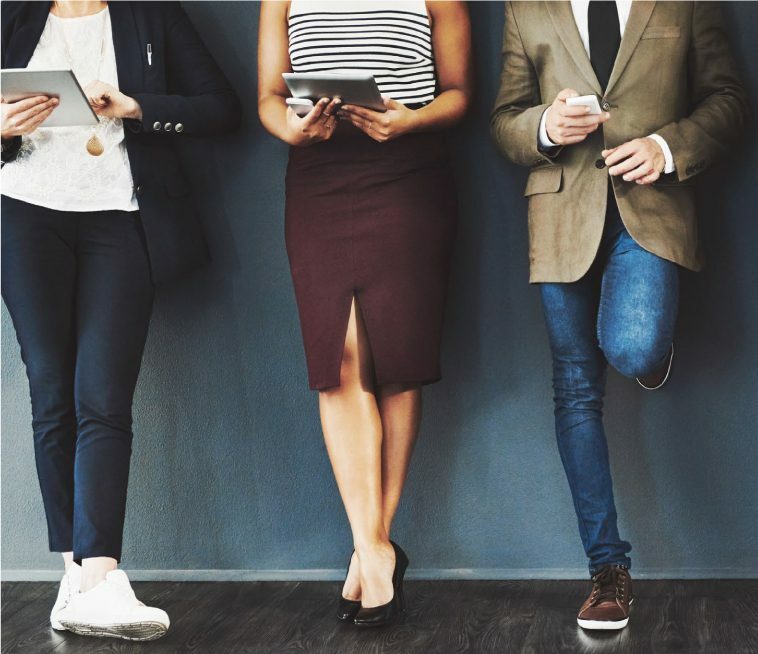 Another positive development for the airline is the upcoming delivery of its first Airbus A321neo in May with the first commercial flight scheduled for June 6. The thoroughly modern, efficient and eco-friendly Airbus A321neo will take La Compagnie’s in-flight experience to new heights with more comfort and state of the art on-board technology, including complimentary Wi-Fi service.